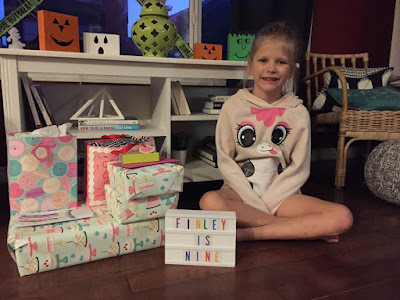 Yesterday Finley turns 9 years old. 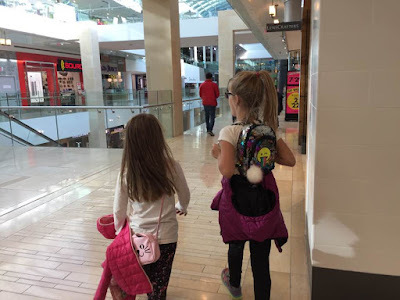 I still can't believe that she is 9. Some days it feels just like yesterday she was born and other days I feel like she is been with us forever. As is birthday tradition, I woke her up before she woke up so I could get her first photo of the day in bed as she was waking up. 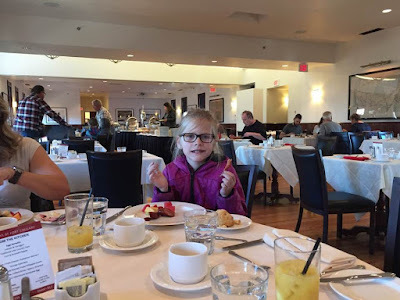 The girls also like a special breakfast in bed too but since we were going for brunch with Greg's mom before she headed back to SK, I just got her her favourite donut at Tim Horton's to tide her over until brunch. 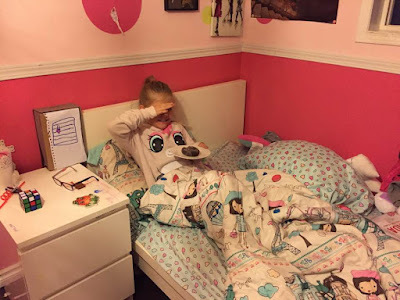 As soon as she finished her donut, she headed downstairs to open her presents but she had to wait for Greg to wake up first haha. She was not very patient waiting but she did and eventually he made it down stairs haha. Finley loved all her presents and there was definitely a theme to all her presents - she got a paris snow globe, paris socks, paris necklace and paris t-shirt along with a new pair of headphones, a light up alarm clock and Penelope bought here the camping set for her american girl and they spent a lot of time setting up the tent that you see. 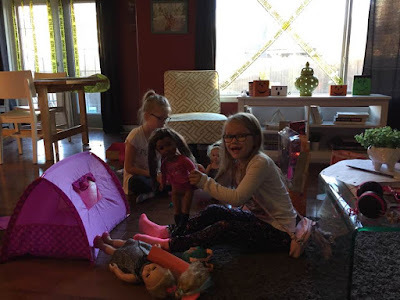 Greg told them that it was great practice for doing it in real life since the girls want their own tent (not happening anytime soon). This made Finley very happy to practice although Greg did have to help a little bit haha. We met Uncle Brad, Kari + Gail at Fort Calgary (more on another blog post about that). Finley ate all the pineapple and bacon that she could for her birthday breakfast hahah. 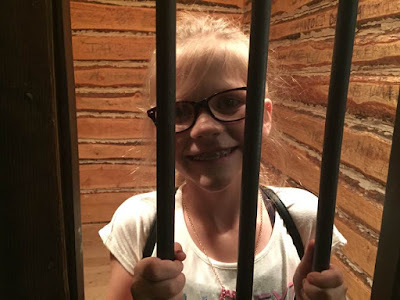 After brunch we got our stickers and toured around Fort Calgary. We were here about 4 years ago last and the kids didn't remember it. They had a fantastic time there. 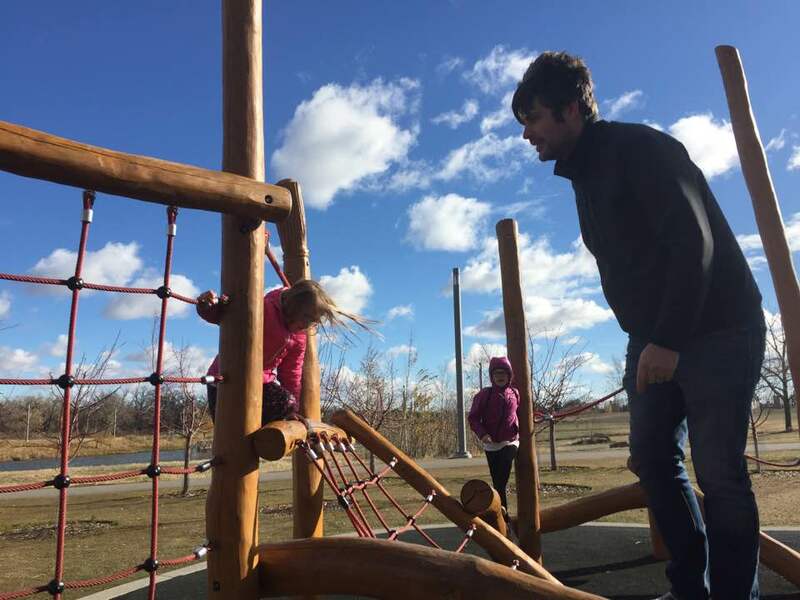 After brunch and the tour of Fort Calgary, we headed to the natural playground but we didn't last too long because of the wind. 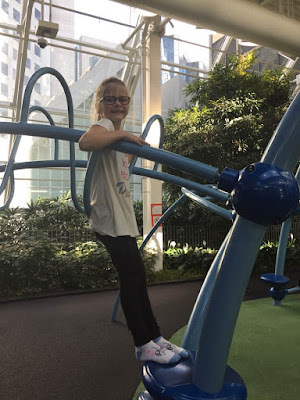 The wind really thwarted a lot of our plans for the day so I suggested we head to The Core and the indoor playground at the Devonian Gardens. It wasn't too busy here but Finley finds this playground too boring so she didn't last long. She did enjoy spending a lot of time looking at the fish. The Devonian Gardens still isn't open completely but you can access more now then you have for years. 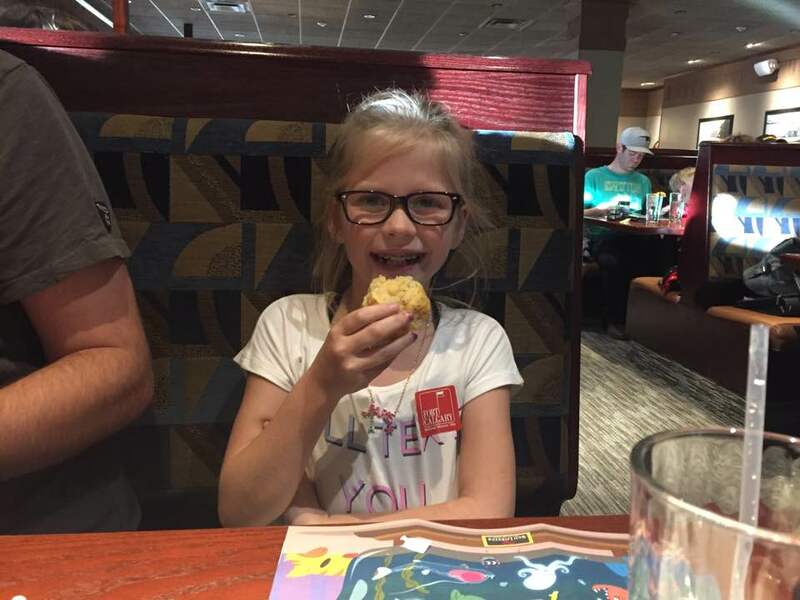 We let Finley choose any place she wanted to go for supper and she chose Red Lobster because she loves the biscuits and popcorn shrimp. 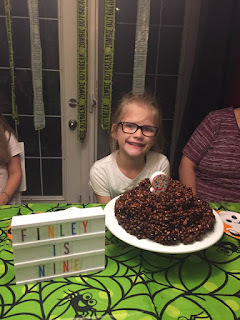 Her birthday cake of choice, which we had the night before, was puffed wheat caked. I made it in my cake pan tiers so it would look fancy but it looked like a giant puffed wheat poop emoji which totally made her day hahaha. She said she had a fantastic day and was very happy turning 9. She had so much fun that she can't wait until she turns 10 and can celebrate again. Slow down baby girl, you got lots of time left!